Switzerland – On this World AIDS Day, 2018, the UN Migration Agency, reflects on how accessible HIV testing is for migrant populations. Migration does not equal HIV vulnerability, and not all migrants are at increased risk for HIV. However, in many contexts migrants are exposed to a unique set of socio-cultural, economic and environmental factors that make them more vulnerable to HIV. For example, they may be at high risk of HIV infection as they often face marginalization and exclusion, and various barriers to accessing health promotion and care. As mentioned in the 2018 UNAIDS Report - Knowledge is Power, “migrants have specific legal and administrative impediments to accessing HIV testing and other services (particularly where they are undocumented and, as a result, are not entitled to health care), and they face cultural and linguistic barriers, racism and xenophobia that serve to restrict access. They also have a higher frequency of delayed HIV diagnosis than people among the general population”. Around the world, IOM works with governments and national/international partners to deliver programmes that adopt a rights-based approach to decrease HIV vulnerability and risk among migrants by ensuring equal access to HIV prevention, care, treatment and support, and countering misinformation and stigmatization surrounding migration and HIV. For instance, as a component of IOM’s pre-departure health assessment programmes, IOM offers counselling and testing for HIV for refugees and migrants traveling to over fifteen host countries. In 2018 to date, IOM provided over 70,000 voluntary HIV tests, including pre- and post-test counselling, in more than 50 IOM operations worldwide. Where necessary, IOM provides referrals for follow-up care to local or national health systems. Mrs. Jacqueline Weekers, Director, Migration Health Division said “In order to achieve the 90-90-90 targets by 2020, all countries need to accelerate their testing and treatment programmes, and this can’t be done without the inclusion of migrant populations in order to reach the goal of leaving no one behind”. All HIV testing needs to be voluntary, confidential and with counseling support. If positive, all persons without any regards on their nationality or migration status should have access to adequate high-quality healthcare, treatment and support. IOM urges governments and partners to move forward the Universal Health Coverage Agenda, the revision of policies related to restrictions on entry-based on HIV status and the development of migrant-friendly policies, adapted towards inclusive health systems and stigma free societies. As mentioned by Michel Sidibé, UNAIDS Executive Director, “HIV testing gives people the knowledge they need to make choices—choices on the right options for treatment and prevention. Knowledge really is power. The power of people to determine the right options to keep healthy. And the power to stay well and live long and productive lives. Let’s ensure that everyone has that power”. On this World AIDS Day, IOM enhances us to include access for HIV testing for migrant populations as a topic to discuss in every HIV dialogue, allowing the development of inclusive policies which would decrease their risk to HIV and improve their access to migrant friendly health services. For further information, please contact Jorge Galindo GALINDO jgalindo@iom.int at the Migration Communication Division or Carlos Van der Laat cvanderlaat@iom.int at the Migration Health Division in HQ. Geneva – IOM, the UN Migration Agency, reports that 107,216 migrants and refugees entered Europe by sea in 2018 through 28 November. This year is the fifth straight during which the arrival of irregular migrants and refugees has topped the 100,000 threshold – although 2018’s total is low compared to those recorded at this time in 2017 (160,440) and 2016 (350,549). 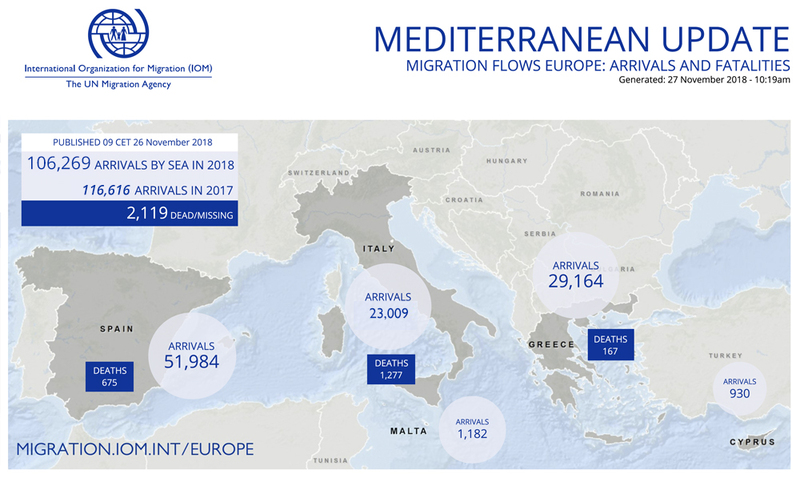 IOM Rome’s Flavio Di Giacomo on Thursday noted that all seaborne irregular arrivals in the Mediterranean region remain lower – by almost 10,000 people – than arrivals last year at this time only to Italy, which recorded 117,042 through this date (see chart below). Di Giacomo noted as well on Thursday that a Spanish fishing boat, the “Nuestra Madre Loreto,” has been stuck at sea for six days now after rescuing 12 migrants who sailed from Libya on a dinghy earlier this month. 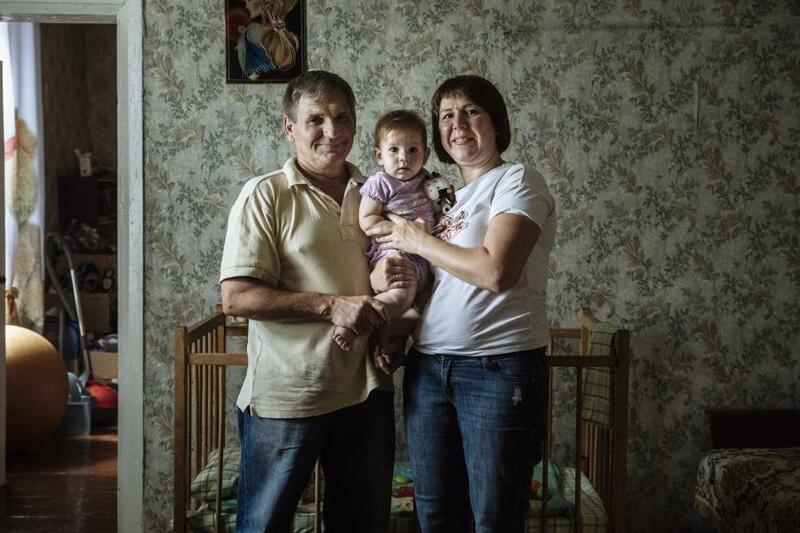 Thus far no EU country has agreed to grant these migrants authorization to land. IOM’s Missing Migrants Project (MMP) has recorded 2,123 people who have drowned or gone missing on migratory routes across Mediterranean in 2018. Most recently, three people drowned in the Western Mediterranean where Spanish rescue services recovered the remains of three migrants from a sinking boat in the Alboran Sea on 28 November; 90 survivors from that voyage were disembarked in Motril, Granada. 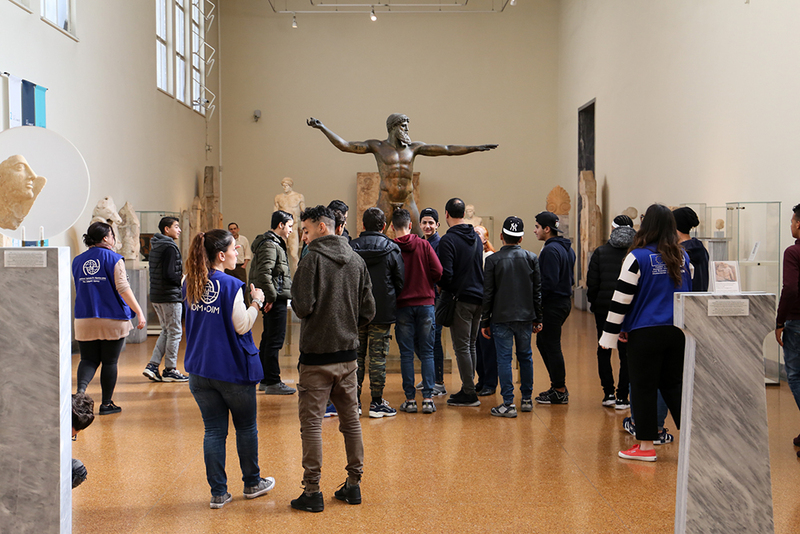 MMP also increased by one its total of drownings on the Central Mediterranean route because it received new information about an incident that occurred on 15 November off Sardinia in which at least 10 youths from Algeria were lost. Since IOM first reported on this incident another body has been recovered. MMP now believes six victims remain missing, with four bodies recovered. Initial reports indicated only nine victims were recorded. IOM Spain’s Ana Dodevska reported that through Wednesday (28 November) 4,277 men, women and children have arrived as irregular migrants this month, or slightly more than 1,000 people per week. This is a sharp drop from October (nearly 2,500 per week) or September (almost 1,900) when deaths at sea were lower, despite the higher arrival volume (see chart below). IOM Greece reported on Thursday that no rescue operations have been conducted by the Hellenic Coast Guard (HCG) since at least last Tuesday (27 November) and that over two of four days this past week (25-28 November) IOM has been made aware of no new sea arrivals to Greece via the eastern Mediterranean route. On those other two days – when there were arrivals to Chios, Samos, Lesvos and Leros – a total of 253 migrants came ashore, including 89 last Sunday to Leros, an island rarely accessed by irregular migrants or the smugglers who transport them. 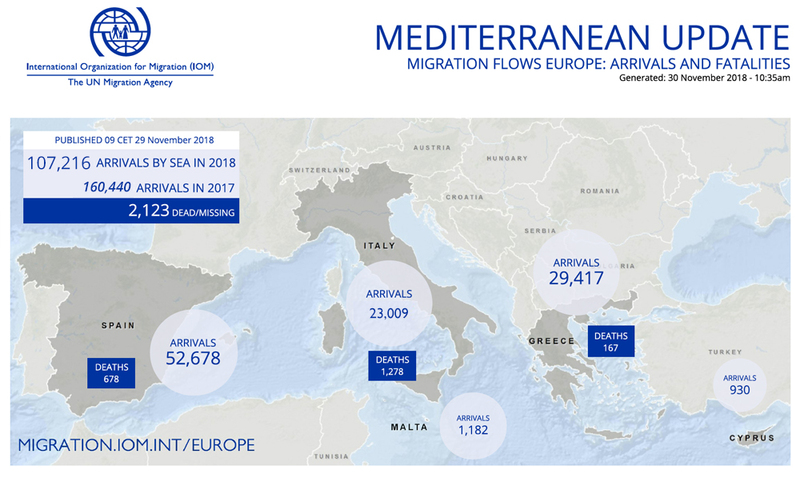 Those 253 arrivals (236 on Sunday and 17 on Monday), bring to 29,417 the total number of sea arrivals to Greece this year through 28 November. That is just short of the total (29,595) arriving through all last year, a total that appears will be surpassed in the coming days (see chart below). IOM Greece’s Christine Nikolaidou also reported that land crossings to Greece by irregular migrants mainly using Turkey and Bulgaria are, through ten months of 2018, well ahead of crossings from the same period last year. During the period 1 January to 31 October 2017, 5,428 irregular land arrivals were recorded by the Hellenic Police monitoring movements either from Bulgaria or Turkey. During the same period in 2018 the same authorities recorded 15,276 irregular arrivals – nearly triple the previous year’s rate. IOM’s Missing Migrants Project (MMP) has recorded 3,323 people who have died or gone missing on migratory routes across the globe in 2018 (see chart below). Beyond the Mediterranean, the MMP team recorded several deaths on land routes in Europe. On 27 November, the remains of four men were found on train tracks near the town of Fylakas, in north-eastern Greece. Local authorities reported that a night train ran over the group of migrants, who may have been sleeping on the lines. On the same day, a young Algerian man reportedly drowned in the Reka river, in Ilirska Bistrica, Slovenia. He was travelling with a group of six migrants, who were apprehended by authorities on 27 November. A vehicle accident on Wednesday, 28 November killed a young Syrian man in the Egnatia Odos highway, near the town of Kavala, Greece. 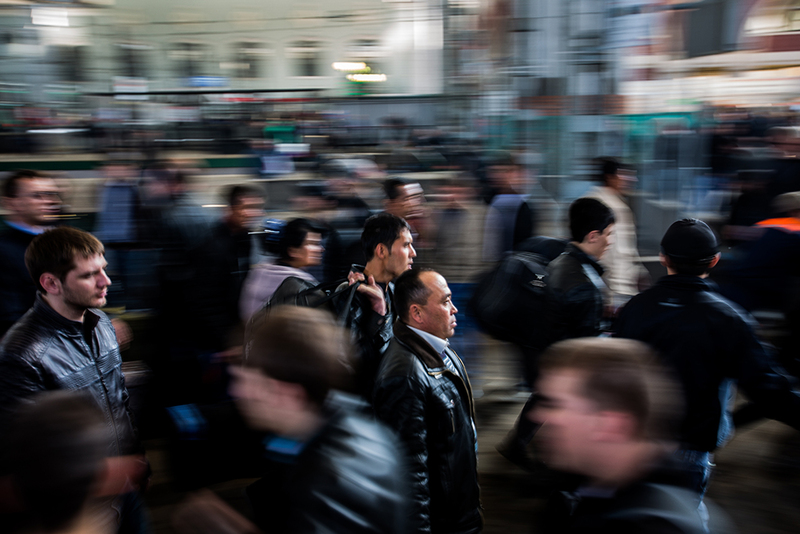 Missing Migrants Project data show that migrants are often forced to take unsafe modes of travel, as transportation accidents are the cause of 48 per cent of migrant deaths recorded in Europe in 2018. In the Americas, four people who had left their homes to migrate north lost their lives. On 26 November, a one-year-old baby who was travelling with his mother from their home country, Guatemala, died of pneumonia in Meoqui, Mexico. The week before, the remains of a 28-year-old Cuban woman were found off the coast of Guanaja, Honduras. She was part of a group of 18 Cuban balseros (rafters) who were trying to reach the US by boat. However, their craft capsized near Honduras’ Bay Islands, in the Caribbean Sea, and those on board were forced to swim to shore. On 16 November, the remains of an unidentified man were found on railroad tracks near the town of Atotonilco de Tula, in Mexico’s state of Hidalgo. Another man was found dead near train tracks on 28 November in Hermosillo, Sonora. The MMP team has recorded the deaths of 39 people due to train-related injuries across Central America and Mexico since the beginning of the year. Buenos Aires – The UN Migration Agency (IOM), and Argentina’s National Directorate for Migration (DNM, by its Spanish acronym) organized last Tuesday (27/11) a session to strengthen migration management from a perspective of human rights and gender – with a special focus on the Venezuelan population arriving here. Some 130,000 Venezuelan nationals are believed to be residing in the Argentine Republic, according to official data, while the year-on-year comparison of entries and exits shows continuing growth. According to the official statistics – included in the last report of the Regional Interagency Coordination Platform for Refugees and Migrants from Venezuela – Argentina is the South American receiving country with the fourth highest number of Venezuelans, following Colombia, Perú and Ecuador. 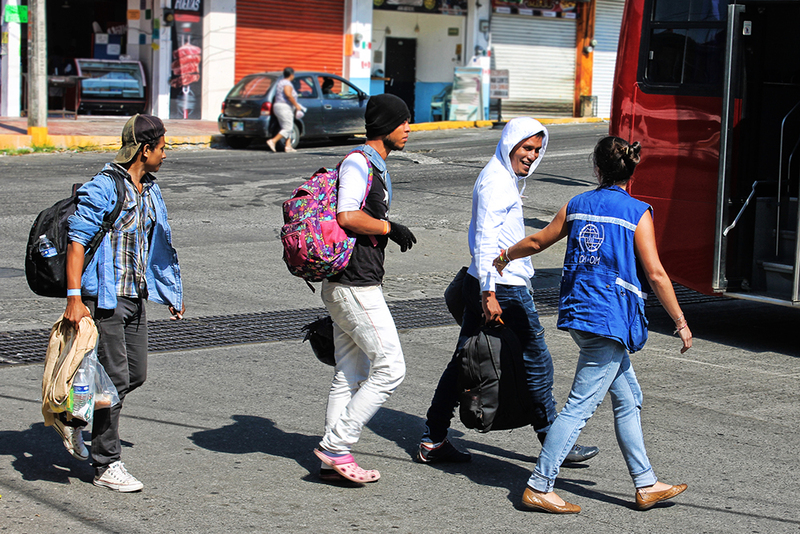 The Government of Argentina works with IOM on actions aimed at strengthening the reception and integration of refugees and migrants coming from the Bolivarian Republic of Venezuela. Among these actions are the implementation of two rounds of the Displacement Tracking Matrix (DTM) in close coordination with the DNM. Moreover, IOM has hosted three guidance sessions targeted at addressing Venezuelan professionals seeking work in different fields. 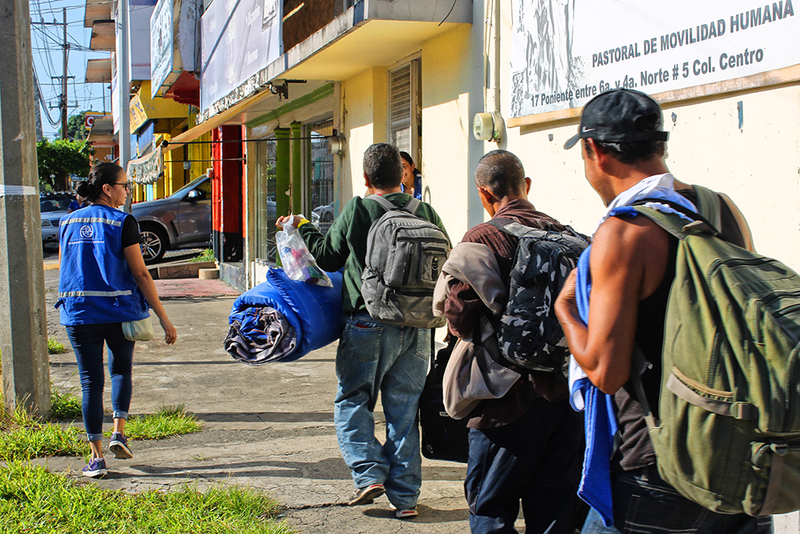 “The growing flow of Venezuelan nationals coming to the country requires us to double our efforts to provide a coordinated response to the specific needs of these persons,” said IOM Argentina Head of Office Gabriela Fernández. Some of the issues analysed at this week’s event were migration governance; immigration and border management; counter-trafficking; and labour migration assistance to vulnerable migrants from a gender-based perspective. The methodology favoured dialogue and debate. 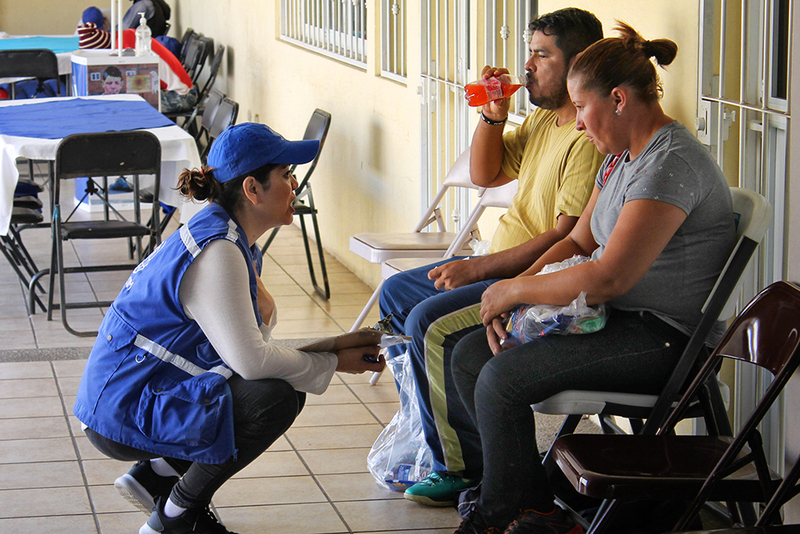 The initiative is framed within the IOM Regional Action Plan launched in April this year, to respond to the recent flows of Venezuelan nationals in the Americas and the Caribbean. 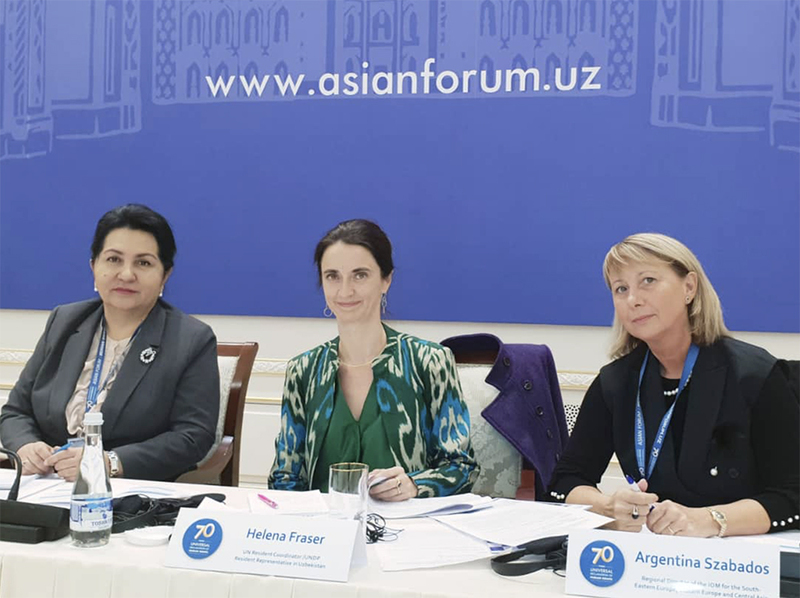 The Action Plan includes the needs and priorities expressed by concerned governments, and it is complementary to existing regional and national coordination mechanisms. 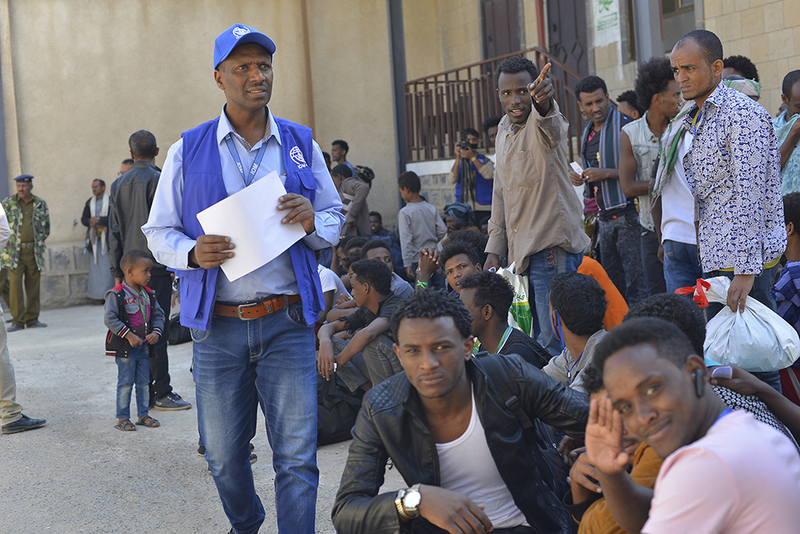 Sana’a / Addis Ababa – The UN Migration Agency (IOM) this week (26-29 November) began assisting 418 Ethiopian migrants stranded in Yemen to safely return under IOM’s Voluntary Humanitarian Return (VHR) operation. This is IOM’s first airlift since shortly after the conflict broke out in 2015 and the largest VHR operation carried out by IOM in Yemen to date. 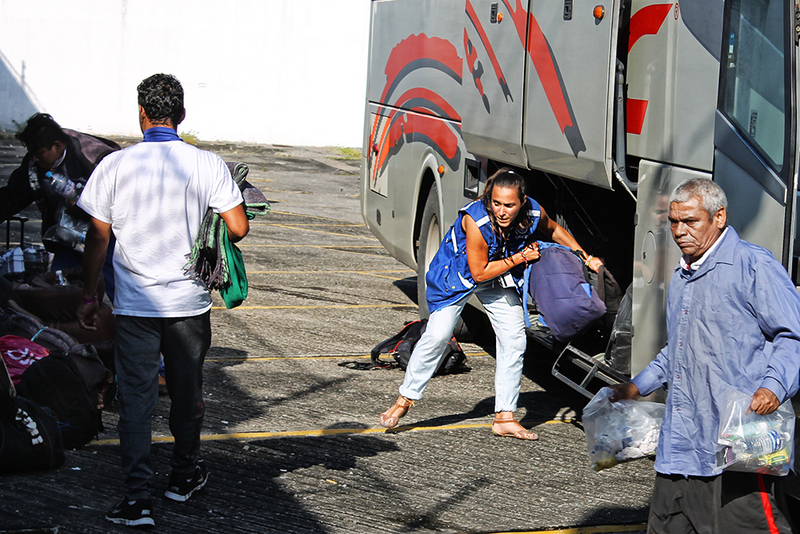 IOM has been assisting many of the migrants returning this week for at least six months. Already in 2018, IOM’s VHR programme has assisted 668 migrants to return to Ethiopia on ships carrying migrants across the Gulf of Aden. Unstable weather conditions at sea combined with escalated fighting in and around Al Hudaydah ports posed major operational challenges in previous return operations. The ongoing conflict – now well into its fourth year – has not stemmed the flow of migrants to Yemen from Africa. Most of those migrants are intent on reaching Yemen and the Gulf countries for work opportunities. Yet upon arrival in Yemen, many discover they are unable to continue the journey due to the security situation, which includes severely restricted land routes and closed borders. “A significant portion of the new arrivals are unaware of the severity of the situation in Yemen or the distance they will have to transit. 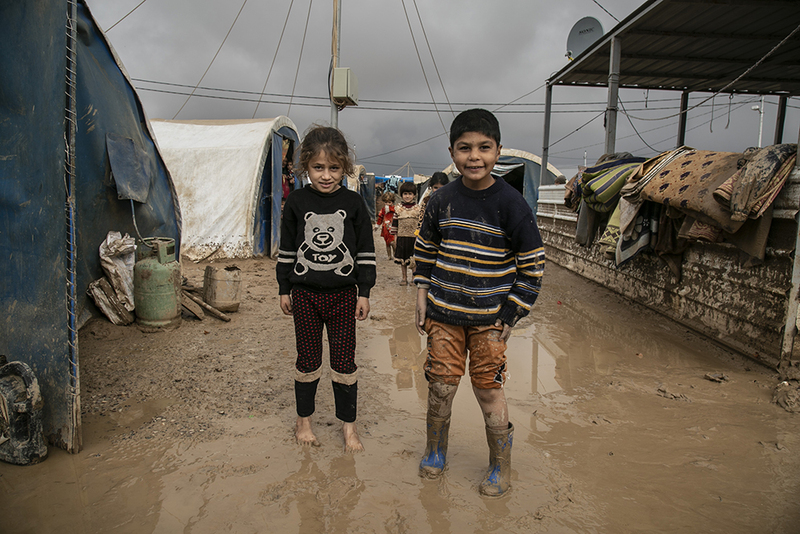 They have found themselves stranded in a conflict-stricken country without access to basic needs and subjected to multiple forms of abuse, exploitation and violence,” said David Derthick, Chief of Mission in IOM Yemen. Nonetheless, IOM estimates that nearly 100,000 migrants reached Yemen in 2017. By the end of 2018, this number will likely increase by 50 per cent. The Organization’s VHR Programme is an orderly, humane option provided to migrants willing to return to their country of origin. 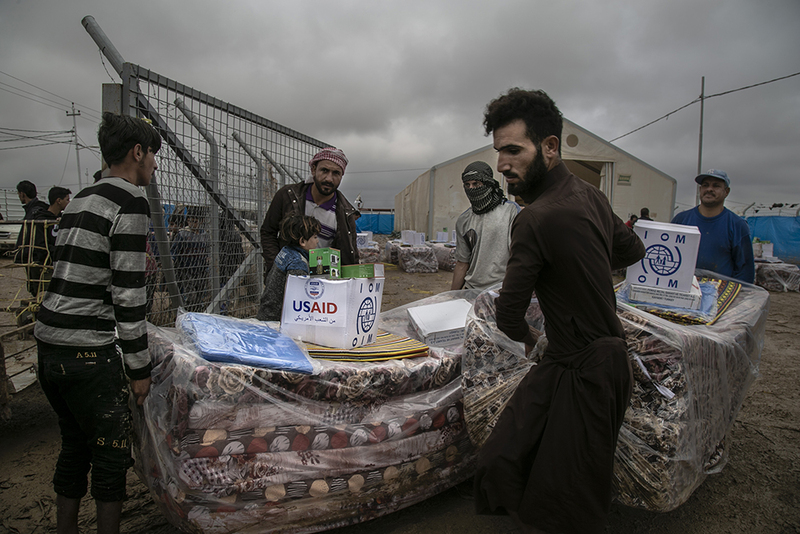 Prior to departure, migrants receive lifesaving assistance – including food, non-food items and accommodation in addition to medical, mental health and psychosocial care. As the returnees arrive in Ethiopia, they undergo health screenings before being temporarily housed at an IOM transit centre where they are provided with hot meals, health care referrals and assistance to reach their home communities or final destinations. 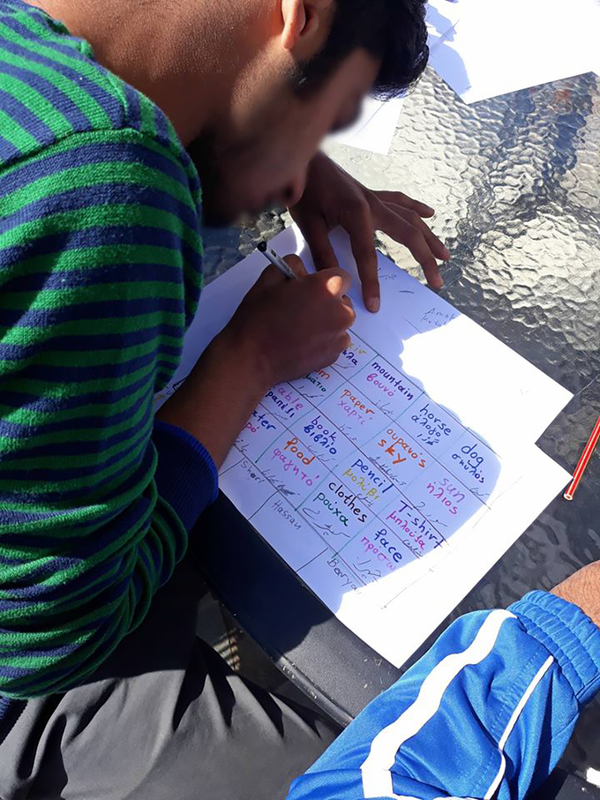 For unaccompanied and separated migrant children, IOM provides family tracing assistance, allowing them to eventually reunite with their primary caregivers. Globally, IOM is committed to ensuring returnees can access opportunities that help them restart their lives and deter them from embarking on dangerous routes in the future. In Ethiopia, IOM supports the reintegration of vulnerable returnees through vocational skills training, education, psychosocial support and small business grants. 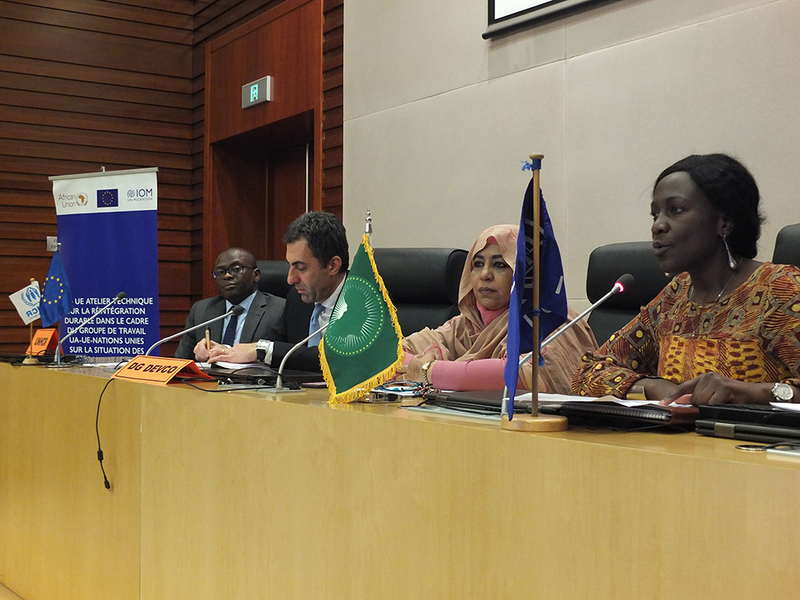 IOM Ethiopia seeks further funding to support the reintegration of vulnerable returnees from Saudi Arabia, Yemen and parts of Southern Africa. Additionally, IOM calls for long-term, sustainable measures that protect the dignity and well-being of migrants as they travel across the Horn of Africa and into Yemen. These include enhanced search and rescue missions along treacherous land and sea passages; solutions to the drivers of dangerous migration; and an end to the conflict in Yemen. An upcoming conference, Drawing on Peace Dividends in the Horn of Africa to Ensure Urgent Enhancements in the Management of Migratory Flows to Yemen and the Gulf Countries, will be convened by IOM next week in Djibouti. The event will bring together governments in the Horn of Africa, and the Gulf, as well as UN and NGO partners, to identify practical solutions to dangerous migration flows and inform the new planning phase of the Regional Migrant Response Plan. 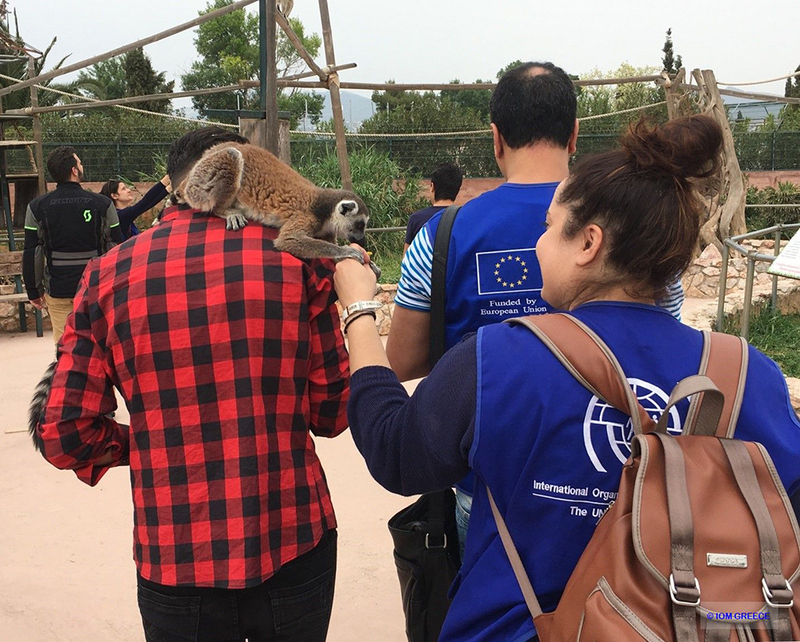 The governments of Canada, the Czech Republic, Germany, the Kingdom of Saudi Arabia, Kuwait, the United Arab Emirates, as well as the UN Office for the Coordination of Humanitarian Affairs, provide support for IOM’s voluntary return programmes. IOM migrant assistance and protection activities in Yemen and Ethiopia are funded by Canada, the Czech Republic, Denmark, Finland, Germany, Norway, the Kingdom of Saudi Arabia, Sweden, the United Arab Emirates, the United Kingdom, the United States of America as well as the UN Office for the Coordination of Humanitarian Affairs. 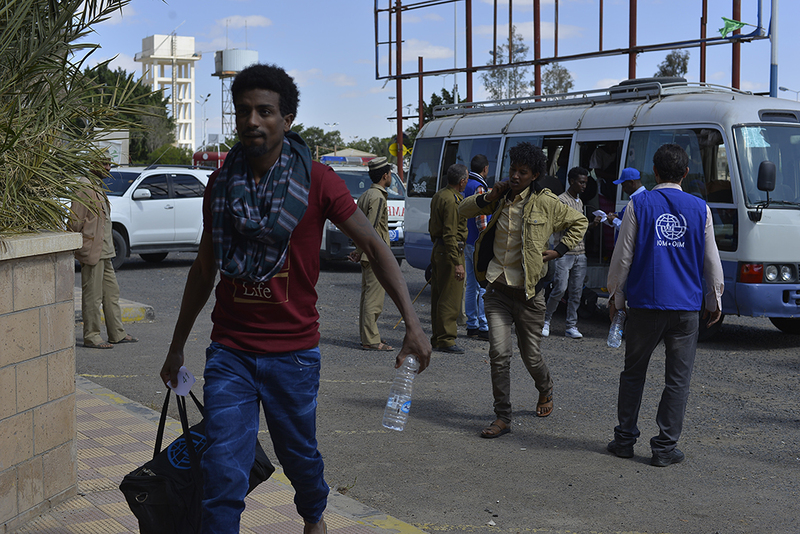 The UN Migration Agency (IOM) began assisting 418 Ethiopian migrants in Yemen to safely return yesterday in a Voluntary Humanitarian Return (VHR) operation. “The operation will continue for another four days, and we hope that it would continue in the future as it is a much safer method of moving migrants home,” said John McCue, IOM Deputy Chief of Mission in Yemen during the embarkment of the first airlift on 26 November. 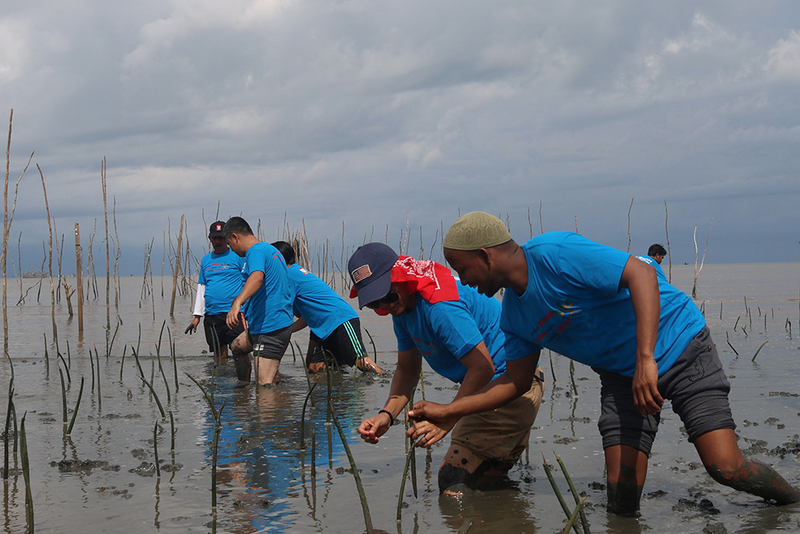 Makassar – Refugees assisted by IOM in Makassar, South Sulawesi, last week volunteered to join a community project to plant over 500 mangrove plants at the Kawasan Ekowisata Mangrove Lantebung in Tamalanrea district. 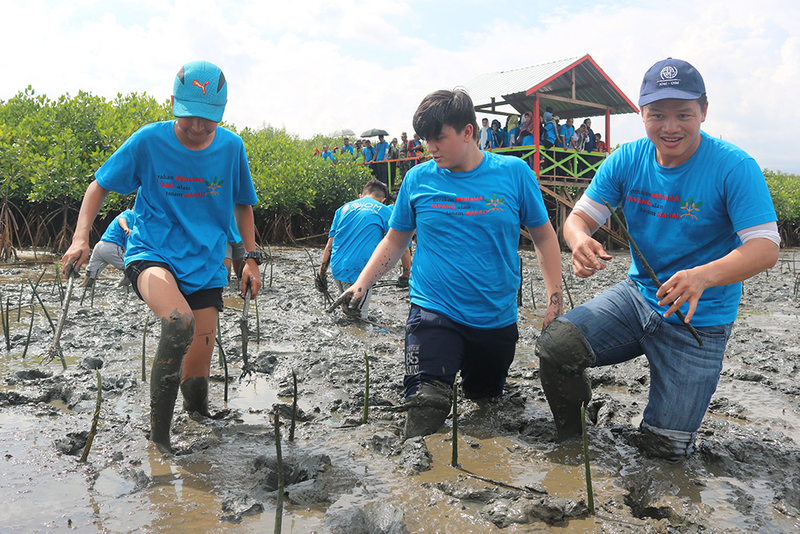 The initiative – Together in Action – Loving Nature – Planting Mangroves – brought together 150 volunteers, including families with children. Half of the volunteers were refugees from Afghanistan, Sudan, Somalia, Ethiopia, the Islamic Republic of Iran, and Myanmar living in Makassar. “Together we can build a better place for us all – for animals, for plants and for humans. This programme helps us to understand the benefits of planting mangroves, which protect the habitat, produce oxygen, and beautify nature,” said Ichsan Ashari Achmad, a marine and fisheries student at local Universitas Hasanuddin, who explained to the volunteers how to plant mangroves, how they grow, and their essential role in the ecosystem. “We had a lot of fun outdoors, enjoyed the green of the mangrove forest and the blue of the ocean. It was the first time for me and my friends to do something like this. We met with local people and got to learn about mangroves,” he said. Muhammad Kasim, the head of nearby Bira village, also welcomed the project, which was sponsored by IOM and the city of Makassar. “The mangroves are crucial, especially for us living on the shoreline. The local economy in Bira and the surrounding areas depend on fishing and crabbing in the mangroves. We really appreciate the participation of the refugees in this project,” he said. The local community will care for the new mangrove plants until they take root. Brussels – IOM, the UN Migration Agency, recently upgraded the Rungika domestic money transfer system in collaboration with the Universal Postal Union (UPU) and the Burundi National Postal Service (RNP). The system, designed to boost cost-efficient and secure money transfers between the diaspora and the communities of Burundi, is now available at the international level. In launching its international corridor, in partnership with RIA Money Transfer, Rungika will leverage upon the already operational domestic money transfer service. It follows the completion of a pilot phase that involved the Government of Burundi through its postal network and the UPU. The Rungika project aims to strengthen the link between migration and development, as well as to support financial education and communication among rural communities in Burundi. It was developed after analysis revealed that Burundi’s rural areas were affected by issues such as expensive informal remittances, financial exclusion, communication difficulties and a lack of economic opportunities – all of which are barriers to the socio-economic development of migrants and rural communities. With the international money transfer service activated, trends show that affordable money transfer is positioned to grow even further. Via the 144 national Rungika agencies, the RNP has been facilitating domestic money transfers for clients in remote areas across Burundi since 19 June 2017. As of November 2018, RNP has received nearly 20,000 deposits, amounting to a total of 1,238,284,150 Burundian Francs (approximately USD 695,400). Between October 2017 and March 2018, several road shows took place in Burundi’s major provinces to popularize Rungika, and marketing and communication activities such as radio programmes and TV spots have been rolled out since October 2017. “Thanks to the support of its partners, IOM, UPU and RIA, this new money transfer corridor will position RNP as a key player in international remittances in Burundi,” said Odette Bolly, Labour Migration and Human Development Officer at IOM Burundi. The Rungika project contributes to Sustainable Development Goal (SDG) 10 Target 10C, which aims to reduce the transaction costs of remittances. In Burundi, IOM continues to support migration for development by facilitating the positive use of remittances in rural areas; promoting investment opportunities for the diaspora; mobilizing the competencies of Burundian diaspora to contribute to the reconstruction, national development and nation-building goals of their country of origin; and building capacities and strategic partnerships with the private sector. Additionally, IOM is supporting the government in the development of a National Migration Policy that will be coupled with the negotiation of Bilateral Labour Agreements with key destination countries of Burundian migrant workers. All these initiatives are designed to enhance financial inclusion and empowerment, and better protect Burundian migrant workers’ rights. 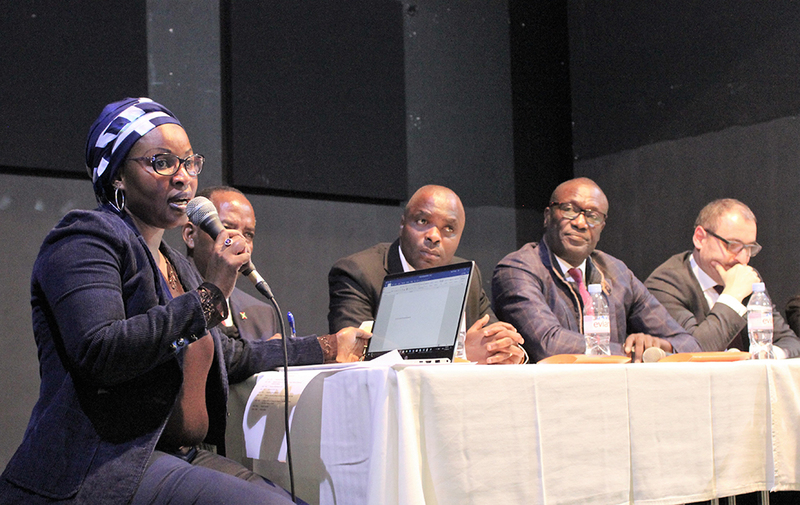 Odette Bolly, IOM Burundi, introduces the panel of stakeholders involved in the launch of international money transfer service ‘Rungika’. This year marks the fifth straight during which the arrival of irregular migrants and refugees has topped the 100,000 threshold – although 2018’s total is low compared to those recorded at this time in 2017 (159,996) and 2016 (348,591). IOM Rome’s Flavio Di Giacomo on Monday reported that on Saturday evening (24 November), a boat carrying 264 migrants arrived at Pozzallo, Sicily. The migrants remained on board for about three hours before disembarking at the port, where IOM staff provided assistance. Most of these migrants came from the Horn of Africa. Migrants on board told IOM staff of they had left Libya from the port of Misrata on the night of 22-23 November. Their wooden fishing boat was divided into three decks. These migrants reported they had been stranded in Libya between one and two years. Many insisted they had been kidnapped and then tortured for ransom and sold several times between groups of traffickers. IOM Spain’s Ana Dodevska reported that through Saturday night (24 November) 3,583 men, women and children have arrived as irregular migrants this month, or slightly more than 1,000 people per week. This is a sharp drop from October (nearly 2,500 per week) or September (almost 1,900) when deaths at sea were lower, despite the higher arrival volume (see Table 5). As colder weather conditions arrive, sea passage to Europe is expected to grow much deadlier. IOM’s Missing Migrants Project (MMP) in Berlin noted this week that since last Friday’s (23 November) update, the Missing Migrants Project team documented the deaths of 44 people in the Western Mediterranean, bringing to 675 the total number of deaths on this route in 2018, and to 2,119 for all three Mediterranean routes. On 22 November, MMP reported, Spanish rescue services recovered the body of a pregnant woman and rescued 42 survivors from a sinking boat off the coast of Almería. According to the survivors’ testimonies, 13 people had drowned at sea before they were rescued. During a search and rescue operation conducted on Saturday, 24 November, 13 people were rescued in the Alboran Sea. The survivors reported to Spanish authorities that one person had gone missing during the journey. On that same day, the Moroccan Navy found the remains of 15 people and rescued 68 others from a sinking boat which had been adrift for hours off the coast of Nador, Morocco. Spanish NGO Caminando Fronteras stated that 14 people already had gone missing before that rescue operation was launched, according to the testimonies of those on board. Thus, it is estimated that 29 people lost their lives in this single incident. In total, 110 people are known to have lost their lives in the Western Mediterranean during these 25 days of November. In the 116 days since 1 August, 367 men, women and children have perished in the waters linking North Africa to Spain. That death rate – more than three people every day – is more than double the fatalities on the Central route connecting Tunisia, Algeria and Libya to Italy, and about five times the losses recorded on the Eastern route between Turkey and Greece (see Table 12). More people have died in the Western Mediterranean during the months of September, October and November through 25 days than died on this route during all of 2017. IOM Libya’s Maya Abu Ata reported Monday details of three interception/rescue operations that were carried out by Libyan Coast Guard in the Mediterranean that resulted in 203 migrants and refugees being returned to Libya’s shore 23-25 November. A total of 27 of migrants (24 men, three women), majority from Sudan and Nigeria, with Egypt, Somalia, Ethiopia, and Senegal also represented. All migrants were transferred to official detention centres. There were no pregnant women or children on board nor any emergency cases. Primary healthcare was provided to the group, and most of them were suffering from stress headache, muscular pain, and fatigue. A total of 113 migrants (91 male, 18 female), including three 3 pregnant women and four children. Nationalities included migrants from Sudan, Sierra Leone, Côte d’Ivoire, Nigeria, Ghana, Cameroon, Gambia, Mali, Benin, and Libya. Primary healthcare was provided; most suffering from general fatigue. A 23-year-old pregnant Nigerian woman suffered from lower abdominal pain and was urgently referred to a private clinic. There were no emergency cases among the migrants. All were transferred to an official detention centre. A total of 63 migrants returned (57 men, four women, two children), mainly from Sudan, Nigeria, Ethiopia, Ghana and Guinea-Bissau. Primary healthcare was provided; most were suffering from general fatigue, and cases of scabies were found. All migrants were automatically transferred to an official detention centre. IOM Libya reports the number of people returned to Libyan shores so far in 2018 stands at 15,064. IOM Greece reported on Monday that from Thursday, 22 November through the end of the weekend, the Hellenic Coast Guard (HCG) was involved in at least four incidents requiring search and rescue operations off the islands of Lesvos, Chios and Farmakonisi. The HCG rescued a total of 86 migrants and transferred them to those respective islands. Another 187 arrivals between Thursday, Friday, Saturday and Sunday to Samos and elsewhere bring to 29,164 the total number of sea arrivals to Greece this year through 24 November. That is just short of the total (29,501) arriving through all 2017, a total that appears will be surpassed in 2018 (see Table 8.b). IOM’s Missing Migrants Project (MMP) has recorded 3,308 people who have died or gone missing on migratory routes across the globe in 2018 (see Table 3). Beyond the Mediterranean, the MMP team recorded the deaths of three men on the US-Mexico border. On Sunday (25 November), the remains of a man were recovered from the banks of the Río Bravo near Piedras Negras, Coahuila. In Tijuana, Baja California, three days earlier, a 36-year-old Honduran man was hit by a vehicle and died shortly afterwards in Tijuana’s General Hospital. On the US side of the border, US Border Patrol officers found the remains of a man in a ranch east of Hebbronville, Texas, on 19 November. In Southern Turkey, a 5-year-old Syrian boy was killed in a vehicle accident in Antalya. This tragic accident injured at least 26 others. It took place on 23 November (see Table 3). Manama – The UN Migration Agency recently launched its introductory training programme for labour recruiters in the Philippines and Bahrain. 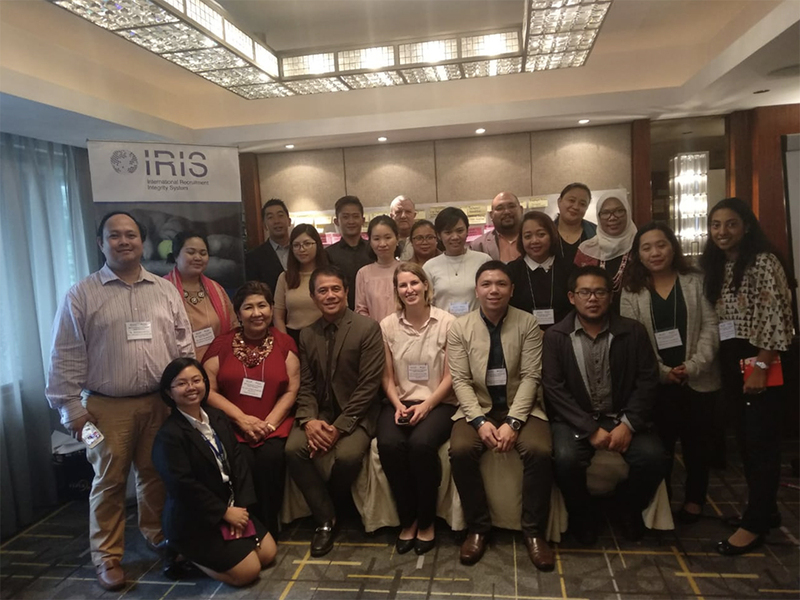 The training, which took place in Manila on 21-22 November and Manama on 25-26 November, is the first step for recruiters who are interested in being certified under the International Recruitment Integrity System (IRIS). IRIS is a global social compliance scheme — developed by IOM, the UN Migration Agency, in collaboration with government, civil society and private sector partners — that is designed to promote ethical international recruitment. It works by defining and setting a benchmark for ethical recruitment (the IRIS Standard) and by establishing a voluntary certification scheme for recruiters. IRIS was created in response to the growing demand from the private sector and governments for ethical recruitment services. 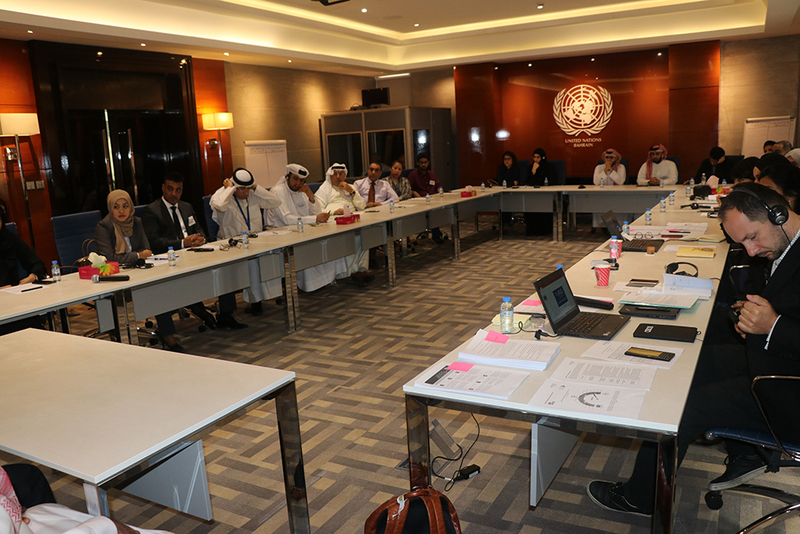 The training course was designed to increase recruiters’ overall awareness of ethical recruitment and to provide practical information on what recruiters need to demonstrate in their management systems in order to be IRIS-certified. In particular, the course introduces recruiters to the business case for ethical recruitment, reveals what comprises the IRIS Standard and explains in simple terms what management systems look like in practice. 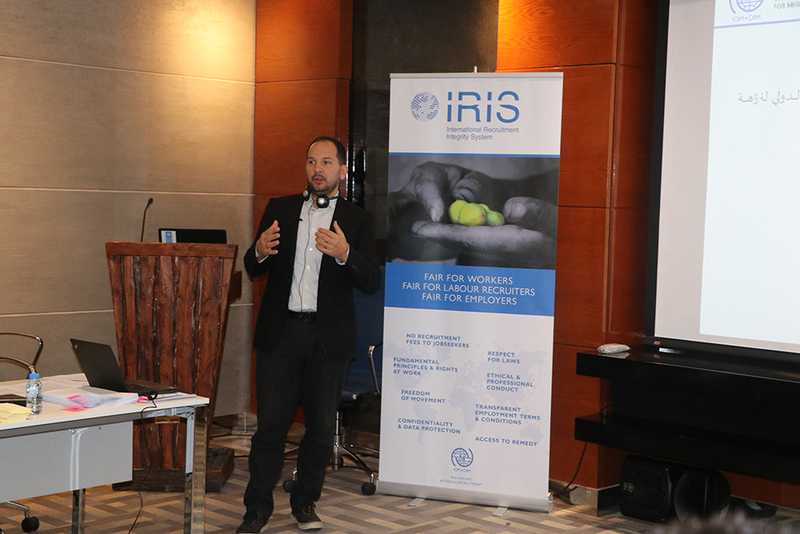 IOM first launched the IRIS training course in Nepal in May 2018 and will continue to roll it out to other countries next year. A new USD 240,000, 20-bed capacity in-patient hospital now stands on the site of what was formerly a small medical post constructed from bamboo and tarpaulins. 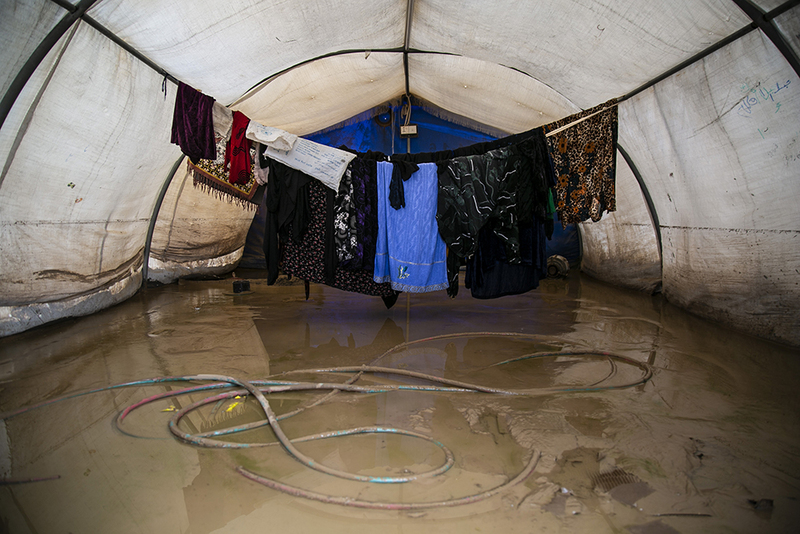 The hospital in Madhurchara, Ukhiya, is the first to offer in-patient services to refugees and members of the host community living in a particularly densely populated part of the camp. The facility will also provide maternity services to improve access to sexual and reproductive health services; a specialised paediatric care unit for children up to the age of 12; a specialized unit for the care of new-borns; and complex laboratory services. According to Dr. Andrew Mbala, IOM Health Emergency Coordinator in Cox’s Bazar, the hospital will ease pressure on the Cox’s Bazar district hospital, which was designed to accommodate 250 in-patients, but often must host up to twice that number. Another new health primary health care facility was also opened by IOM in the camp this week, in close collaboration with the Bangladesh health authorities, who will eventually take over its management and provision of services. The USD 120,000 clinic, which will also provide mental health and psychosocial support, will serve people living in one of the areas of the camp most prone to landslides and flooding. Together the facilities will serve catchment areas totalling around 73,000 people from the refugee and local communities. 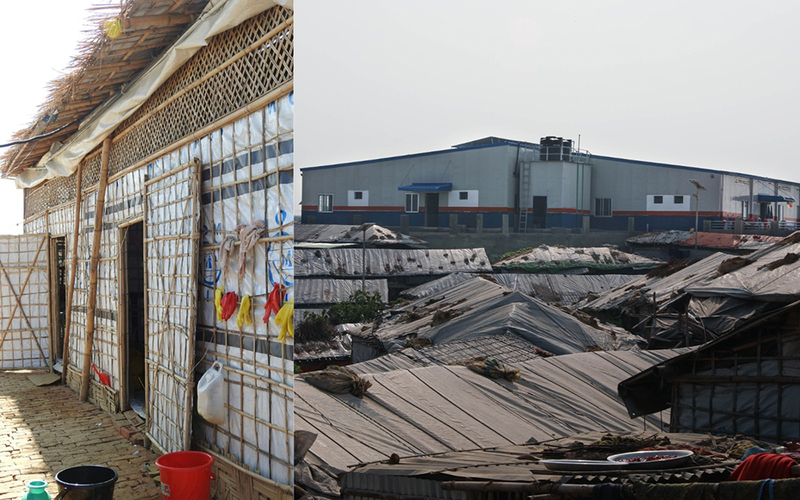 Almost a million Rohingya refugees now live in camps, often in very poor conditions. “In-patient services and comprehensive primary health care are currently a big gap in the refugee camp and these facilities will allow us to provide comprehensive care,” said Dr. Mbala. 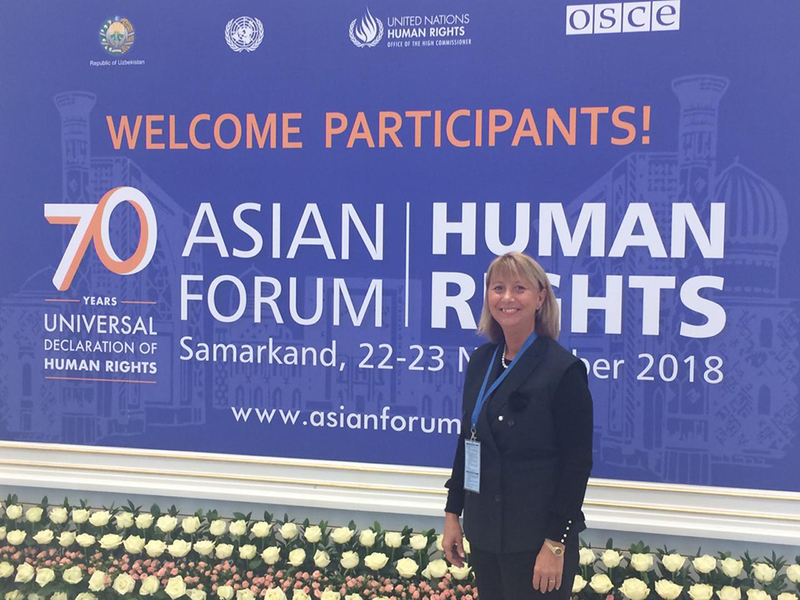 The opening ceremonies this week were attended by senior Bangladeshi officials and representatives of donor governments Australia, Canada, Sweden, Switzerland and the United States. Australian High Commissioner to Bangladesh Julia Niblett opened the two facilities. Prof. A.H.M. Enayet Hossain, Additional Director General of Bangladesh’s Health Department, described trying to meet the health needs of hundreds of thousands of newly arrived Rohingya people at the height of the crisis as “a nightmare.” But more than a year later, “the nightmare was over” and, by working in partnership with organizations such as IOM, “the dream” of providing better healthcare was “step by step” becoming a reality, he noted. “These inaugurations mark the start of a significant and important new phase in IOM’s long-term commitment to working with the Government of Bangladesh to increase and improve health service provision within the host and refugee communities here in Cox’s Bazar,” said IOM Bangladesh Chief of Mission Giorgi Gigauri. For more information please contact Fiona MacGregor at IOM Cox’s Bazar. Email: fmacgregor@iom.int, Tel: +88 0 1733 335221.